Why have I been doing this? Well, I’ve been going to FantasyCon, the British Fantasy Society’s annual UK convention for the past decade or so and last year, Lee Harris, the current Chair asked me to edit a new anthology for the BFS with a particular focus on epic fantasy. I understood what he was asking and why. The BFS is a fan-run organisation with a focus on speculative fiction from horror to epic fantasy. It so happens most of the volunteers, who do all the very hard work without which such organisations simply cannot exist, have been personally more inclined towards the horror end of the spectrum and this taste has been reflected in the society’s publications – one of those unintended consequences. Meantime, the growing attendance at FantasyCon (an event open to all, not just BFS members) has shown the keen appetite for epic fantasy among those attendees, not least in the packed-out rooms for the fantasy-discussion panels and the interviews with Guests of Honour such as (but not limited to) Raymond Feist, Gail Z Martin and Brent Weeks. So this year sees two anthologies from the BFS, one horror-themed, and one specifically epic fantasy, to cater to all tastes. When I agreed to take this on, I had quite a few decisions to make. Some were easy. At the project’s outset, I was doing my second stint as a judge for the Arthur C Clarke Award and was Chair of the forthcoming Eastercon, EightSquared, scheduled for the last weekend in March 2013. So there was simply no way I could declare this an open-submissions anthology and give the necessary, critical attention to however many hopeful stories might land in my inbox. I just wouldn’t have the time. This was going to have to be an invitation-only anthology. What sort of stories would I include? I decided I wanted tales which appreciate the core strengths of epic fantasy; compelling heroes (male and female), battles with swords and sorcery, facing down evil both intentional and accidental, a sense of myth and mystery. I also wanted to celebrate the way our beloved genre is currently flourishing with so much more than simple tales of high adventure or the concerns of kings and wizards. Epic fantasy now offers complex stories of personal growth, of mature reflection, exploration of the rights and wrongs of power. These novels feature people and places from hovels to palaces, enriched by so many more cultures and history than the genre’s original quasi-European inspiration. All threaded through with magic, danger and wonder. But who to invite? This really was the hardest decision of all, because the collection was only going to have eight stories. I could so easily list a couple of dozen excellent authors currently writing the sort of stories I wanted without pausing for thought. So I have done my best to find writers with different styles and approaches spanning the current breadth and depth of epic fantasy. Hopefully there will be something to satisfy each reader’s particular enthusiasms alongside something they haven’t encountered in their reading thus far, whetting their appetite for more. Reading these in draft was definitely a new experience. I’m used to being edited myself but now I was the one looking to nit-pick and ask awkward questions as I put myself in the place of the reader unfamiliar with this author and their work. Fortunately, working with talented professionals, there wasn’t too much of that to do, and our discussions were very amiable. Then I had to pick up my red pen and copy-edit, looking at the fine detail of the actual word-smithing. Actually the main thing I had to do was put my red pen down and sit on my hands, to make very sure I was only highlighting things which needed to be changed for clarity and flow. The temptation for me as an author, to think how I might have written a sentence differently, had to be sternly resisted. Otherwise I risked overlaying the rhythm and character of another writer’s prose with elements of my own writing style. That’s most definitely not an editor’s job. Then I had to find some cover art. ‘Oh… help…’ was my initial reaction – swiftly followed by ‘thank goodness for the Internet!’ I began browsing various genre artists’ websites and discovered that, as well as their published covers and other art, some were displaying pieces of work which had been commissioned but for some reason or other, had never been used. These were available to be licensed. So I began hunting in earnest for such a picture which would somehow simultaneously manage to reflect the very different stories now gathered together. 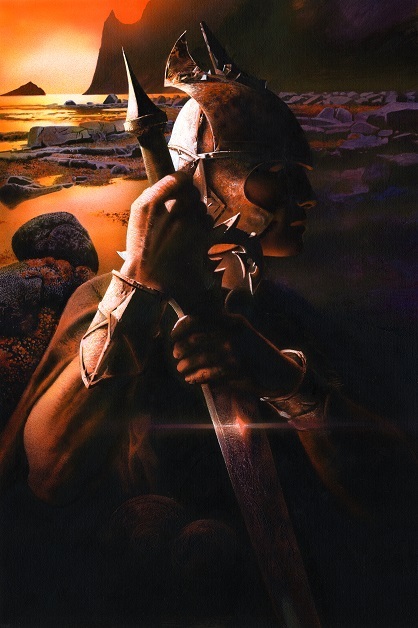 You can imagine how thrilled I was to find ‘Soldier and Sword’ by Geoff Taylor – one of epic fantasy’s most enduring and admired artists (among his other work – if you haven’t seen his wildlife art, do check out his website). And now we’ve been doing the final proof-reading and the book is due to go to print. That’s both a relief, as the job’s finally done, and unexpectedly nerve-wracking, as I must wait to find out how far readers think I’ve succeeded in my aims. In the first instance, those readers will be current BFS members and those who join in the forthcoming months. Obviously, the authors retain the rights to their stories and they will doubtless appear elsewhere to delight their fans. For the moment though, this book is a gift from the British Fantasy Society to those who support it and I am very pleased to have been a part of the project. Previous Post:My very first Science Fiction short story has just been published! Wait… what? I love this line up of authors, Juliet. Something for all tastes, hopefully, and all by very talented writers. That looks like a great lineup — congratulations! Are there any prospects of the book becoming available to the general public? I would also be interested to buy a copy should it be available for the general public.